Like many artists of his day, John Mix Stanley was drawn to the American West. He was an accomplished painter with a keen interest in Native American portraiture, but by circumstance he found himself working for a number of years as a landscape artist. Stanley traveled to Santa Fe in 1846 just as the Mexican-American War had begun and as the Army of the West had seized the city. Stanley was hired as expedition artist to accompany the Army on its march to California. The report of this expedition, Notes of a Military Reconnoissance by Lieut. Col. W. H. Emory, presented 26 of Stanley’s drawings of Indians, landscapes, and natural history specimens. 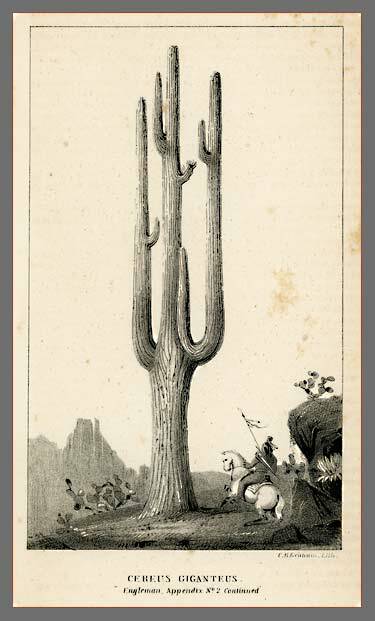 Notably, the very first illustrations of the saguaro, or Cereus giganteus, were drawn by Stanley during this military expedition. In 1853, Stanley was chosen as the artist for the northern route of the Pacific Railroad Survey and also given the task of reworking the drawings of an artist who had been killed in the railroad survey in Utah. His contribution to the survey reports was significantly more than any of the other eleven artists, both in quantity and quality. After this final expedition in the West, Stanley worked as a studio artist in Washington, D.C. until 1862 and settled finally in Detroit where he died in 1872. The tragedy of Stanley’s career is the improbable and repeated loss of his works to fire. More than 200 of his western works held at the Smithsonian Institution were destroyed by fire in 1865, and in the same year, a number of his works housed at the Barnum's American Museum in New York City burned. In 1872 a fire at his Detroit studio destroyed most of his remaining original collection of western paintings. His works were among the finest depictions of Native Americans at that time, and the loss of so much documentation of the West is inestimable. "At the point where we left the Gila, there stands a cactus six feet in circumference, and so high I could not reach half way to the top of it with the point of my sabre by many feet; and a short distance up the ravine is a grove of these or pitahaya, much larger than the one I measured, and with large branches. These plants bear a saccharine fruit much prized by the Indians and Mexicans. They are without leaves, the fruit growing to the boughs. The fruit resembles the burr of a chesnut [sic] and is full of prickles, but the pulp resembles that of a fig, only more soft and luscious. In some it is white, in some red, and in others yellow, but always of exquisite taste."